There are some things you may not think of as a great holiday appetizer unless you just happen to have everything fall into place as far as ingredients and what you have on hand. This was one of those recipes for me. I had some meatballs on hand already that I had made and frozen, so it really just became a matter of putting them together with the rolls and some cheese and we were all set. Now, if you wanted to make this recipe ahead of time and use it for a holiday appetizer, it is certainly easy to do. This is the meatball recipe that I use most often, but you could easily use any meatball recipe you prefer or even use some frozen meatballs you may have on hand to make things even easier. Brush a baking sheet with olive oil. Pulse the celery, carrot, onion, garlic and parsley in a food processor to make a paste. Transfer half of the vegetable paste to a bowl; add the ground beef, ground pork, eggs, breadcrumbs, 1 cup of the Parmesan cheese and 1 teaspoon of salt and mix with your hands until it is just combined. Form the mixture into about 24 two-inch meatballs; transfer the meatballs to the prepared baking sheet. Bake the meatballs until they are firm but not cooked all the way through, about 10 minutes. To make the sauce, heat 3 tablespoons of the olive in a large pot over medium-high heat. Add the remaining vegetable paste and cook, stirring occasionally, until it looks dry, about 5 minutes. Stir in the tomato puree; rinse each can with 1 cup of water and add it to the pot. Stir in the basil, oregano and 1 1/2 teaspoons of salt. Bring the sauce to a simmer, then add the meatballs and simmer until the sauce thickens and the meatballs are cooked through, about 15 to 20 minutes. Remove the basil. Place 1 or 2 meatballs and sauce inside each of the slider rolls and top each with mozzarella cheese. Serve. 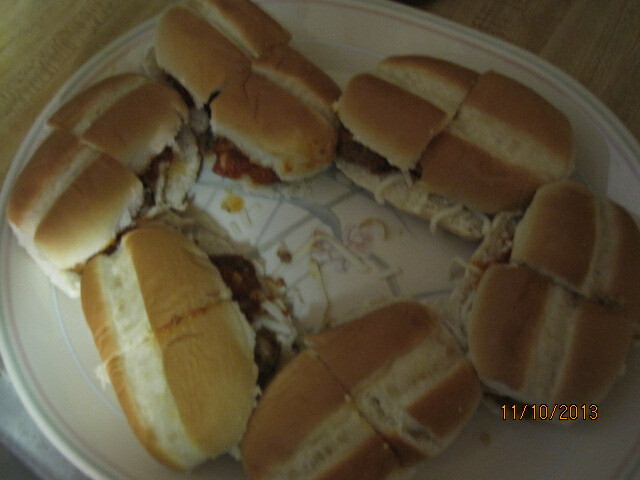 It is a very simple recipe to put together and the sliders were devoured when I made them in no time at all. You could easily do the same thing with sausage and peppers if you had some on hand or wanted to make some ahead of time and then simply re-heat the sausage and peppers and put them into slider rolls. For me, it was just a matter of warming he meatballs and sauce on the stove top for about 5 to 10 minutes just to heat them through and then assemble the sliders. That’s all I have for today. Keep checking back as there is plenty more along the way leading up to Thanksgiving. I have lots of side dishes to share, some desserts, breads and even things to do with leftovers. Keep checking back to see what is next. Until then, enjoy the rest of your day and enjoy your meal!